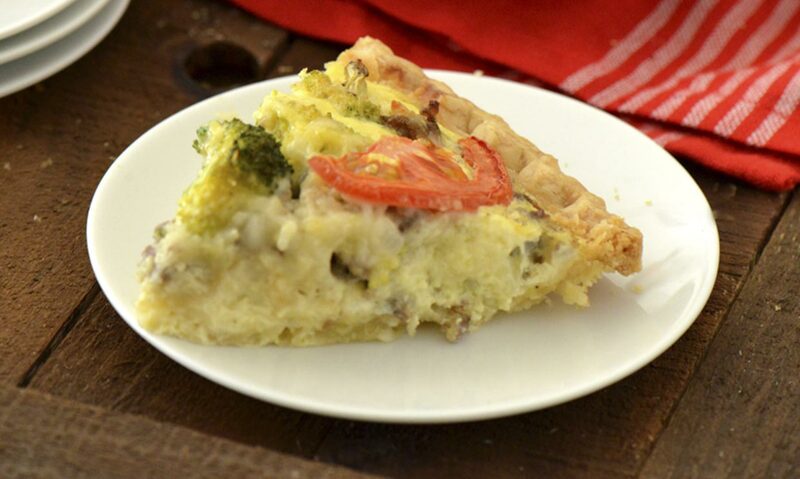 Our Savory Sage Sausage, fresh Roma tomatoes and broccoli are baked in a flaky pie crust for a savory quiche that came be served for breakfast any day of the week. Place sausage in a sauté pan over medium heat. Breaking up with spatula, cook for approximately 7-10 minutes or until browned. Transfer sausage to a plate. Set aside. Bake piecrust for 10 minutes. Remove from oven and set aside. Reduce oven temperature to 325°F. Heat oil over medium heat in same sauté pan used to cook sausage. Combine onion and garlic. Cook for 5 minutes then add broccoli florets. Cook for 5 minutes more. Remove from heat. In a large bowl, beat together eggs and milk. In a separate bowl combine cheese and flour; mix with a fork to thoroughly coat cheese with flour. Add sausage, onion mixture and cheese mixture to egg/milk mixture. Place baked piecrust on a large baking sheet to avoid any mixture overflow. Gently stir and pour into baked piecrust. Top with halved tomato slices, season with salt and pepper and bake for 55 minutes or until egg is set. Remove from oven and let cool for 20 minutes before serving. 1 Preheat oven to 400° F.
2 Place sausage in a sauté pan over medium heat. Breaking up with spatula, cook for approximately 7-10 minutes or until browned. Transfer sausage to a plate. Set aside. 3 Bake piecrust for 10 minutes. Remove from oven and set aside. Reduce oven temperature to 325°F. 4 Heat oil over medium heat in same sauté pan used to cook sausage. Combine onion and garlic. Cook for 5 minutes then add broccoli florets. Cook for 5 minutes more. Remove from heat. 5 In a large bowl, beat together eggs and milk. 6 In a separate bowl combine cheese and flour; mix with a fork to thoroughly coat cheese with flour. 7 Add sausage, onion mixture and cheese mixture to egg/milk mixture. Place baked piecrust on a large baking sheet to avoid any mixture overflow. Gently stir and pour into baked piecrust. 8 Top with halved tomato slices, season with salt and pepper and bake for 55 minutes or until egg is set. Remove from oven and let cool for 20 minutes before serving.